I took up a challenge: I tried to post a blog post every day for 100 days, I learned a lot, this is what I learned. 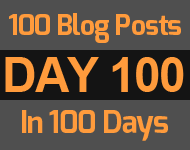 1) Don't try to post a blog post every day for 100 days! Unless you have all day every day to write great quality blog posts. Posting regular low quality posts for 100 days will not help your search engine ranking. 2) You need to define your goals. Get higher in the search engine rankings? 3) You need a strategy based on your goals. How am I going to market the blog post? Who will link to my blog post, and how can I get them to link? 4) You need to know who you are writing for. Create an "avatar". You should write a description of your ideal customer, go into detail about them, who they are, how old, where they work, even their name, as much detail as possible. And then you should address your blog posts to them. I tried doing it at set times, first thing in the morning or last thing at night; I tried setting myself time limits, or just writing until I'd finished. I like a routine but I'm still working out what works best for me. Some people use "free writing" techniques. This is where they have a set period of time where they just write what comes in to their head. Allegedly it helps with creativity and generating ideas. I have yet to try this method. 6) An "editorial timetable" didn't work for me, it set me up for failure. I had a "editorial timetable" ie I planned that I would publish certain types of post on certain days. That didn't work for me because inspiration didn't follow a timetable. 7) Don't obsess about your search engine ranking. Successful bloggers suggest you don't obsess over key words or phrases and just concentrate on quality. One quote from a very successful blogger S. Anthony Iannarino "I don't care about SEO I write what is useful to other people and that seems to work"
8) Don't despair about search engine rankings. If you have 100 competitors in the same area only 3 will get in the first 3 places and only 10 can get on the first page. And especially if you are only one person competing against bigger agencies or companies you may be setting yourself up for failure. But don't despair because there is "the long tail". This is the idea that while there are a large number of searches for key phrases which the top ranking sites will dominate; but there is also a long tail (and large volume) of related terms that you can rank for. It may help to do some research into the terms that might be useful to you. Tip: Try typing your main search term into Google and see what the auto-suggest comes up with, these are real search terms that people have used and may give you ideas for your blog posts. And it may help if you "niche down" ie have a more specific niche you are concentrating on compared to your competitors. Also after you have been blogging for a while you will be able to see which of your blogs have been most successful, and you can build on those. 9) The key is creating valuable content. It's all very well spending hours creating well written, useful content, but what's the point of writing it if no-one is going to read it. If you write a useful article about a product then tweet about it with the hash tag of that product then there's a good chance that the company (who may have thousands of followers) will retweet that tweet, thus driving traffic to your site. 12) Make sure you publish your blog post before you tweet about it. Another vote for concentrating on quality. The Tour De France in Yorkshire was a missed opportunity for me, I took lots of photographs, and video, I should have stayed up all night creating a blog post so I could ride on the social media wave. 15) It will be hard work and take time. Writing coherent, useful articles is hard work. It requires effort. Getting your thoughts in the right order so they make sense and read well isn't easy. And I'm still learning.... ...as you can see. 16) You can't always take Google at their word. Or, you can misinterpret what Google says so you need to be careful. Google said that they would value only "natural" links, i.e., links from people other than yourself who had linked to your site. So I removed all the links I had made to my site from my client sites (the "made by onsitenow web design" links in the footer of the sites). My rankings plummeted. I added them back. My rankings shot up again. 17) The biggest benefit to search rankings is getting links from other websites. 18) Google works in mysterious ways. When I search for "MODX Leeds" I do very well. (MODX is the content management system I blog about). I come on the first page just below the actual MODX company site. But also below a page that has no references at all to MODX and no connections at all, that I can find, to MODX. It really is quite bizarre. 19) There are different types of blog. Blogs about food, personal blogs, technical blogs, news blogs, humour blogs, there are blogs for every niche. 20) There are different types of blog post. Lists, top 10's etc. ; how to's; photo heavy; infographics; video; epic blogs full of useful information; concise blogs like Seth Godin's; blogs linked to podcast; and a mixture of all of the above. 21) There can be a struggle between two competing goals. Writing for your readers, or writing to do well in the search engine rankings. Giving too much emphasis to the latter can damage the quality for the former. For example the general consensus is that longer posts do better, this has the unfortunate side effect that it can encourage people to waffle on. Some blogs are too long. Should I write for a human or the Google algorithm? 22) You will feel overwhelmed. For example: "...just feeling overwhelmed. I'm taking on too much there is too much to do. The sun is shining outside and I'd rather be out there." Just remember it's not like rowing the Atlantic. It's not life threatening, it's just hard work, and it's a choice that I made to do that hard work. I can stop doing it if I want to. But I don't want to, so stop wingeing and just get on with it. 23) You will have doubts about what you are doing. You will get impostor syndrome: "What credentials have I got to be writing about this? Who on earth would want to listen to me anyway?" At this point forget about other people and do it for yourself, there are lots of benefits for yourself anyway (see later). So just quash that voice of negativity. 24) You may make yourself vulnerable. 25) Don't write a blog post in one sitting. The best way to improve the quality of a post is to write it then go away, leave it for a few days and come back to it when you've semi forgotten about it. Then re-read it and see if it makes sense. 26) You can actually write so much you forget what you have written. I wrote the same article twice! In different words and a different way but totally the same subject matter! This suggests I should try concentrating more on quality rather than quantity. 27) What tools you use can effect your productivity. It took me a while to figure out how best to write. And I'm still experimenting now. I don't particularly like writing straight in the editor of my blog, as I chop and change stuff about and it is easier to do that in other systems. Currently I am writing this in Evernote and at some point I will cut and paste it to Dreamweaver, where I will format it and add links and any images. And after that I will cut and paste it to the blog. I think I still need to try other products and workflows to see what works best for me. 28) You need a process to collect your ideas. I use Evernote and lots of notepads spread around the house. You can have an idea at any time, make sure you have some way of recording it before you forget about it. 29) While you are writing one blog post you will have ideas for other posts. Make sure you make a note of them and store those notes. Evernote again for me. 30) Writing about something that seems dull can open up interesting avenues. Writing about something that seemed dull on the surface, has led to other thoughts and ideas that have sparked more interest and inspiration. Careful when you use the word "obviously" as it may not be obvious to your reader. Even when that reader is you coming back to read your own article later! 32) Things will go wrong, but that's not such a bad thing. When things go wrong it can be a good source of follow up posts! You can analyse what went wrong and how you went about trying to solve it. And if you make factual errors you can go back and change things, while being transparent about anything you do change of course. 33) By being more involved in my website I discovered it's weaknesses. When you neglect your website it will drop down in the rankings. By being focused on blogging I became more aware of my sites shortcomings. 34) It's like pulling yourself up by your bootstraps. You think you can't write, but if you do, at first you will be rubbish, then you get better. 35) You need to be consistent. Navigation, your user needs to know how to get around on your site. Keep the navigation positions consistent throughout your pages. 36) You don't have to be special to start a blog. There are plenty of examples of ordinary people writing very successful blogs. Other people can relate more easily to others they see as similar to themselves. Look at Mum's Net. A thesaurus, not just for alternative words but because it can trigger new ideas. 39) You get the benefits of writing in itself. Even if your blog doesn't immediately boost you up the search engine rankings or achieve your goals there are still benefits to you, your knowledge of your subject area and your own self awareness. 40) When you write you learn more about what you are writing about. And you will remember it better. 41) Self awareness, you will learn lessons about yourself. I made resolutions throughout the blog challenge, for example: to spend only 15 minutes on twitter every day, or have a particular routine for writing, and I broke them pretty quickly, sometimes that's justified if something isn't working, but other times it just looks like I'm not keeping my word to myself, which is bad. If you are doing something that doesn't work be willing to quit/change direction! I'm not very good at that. The beliefs you have today may not be the beliefs you have tomorrow. I read things back that I have written before and I don't agree with them, I've change my mind a lot. Blogging gives you the opportunity to write down your thoughts, come back to them later, and say to yourself "What the hell are you talking about?" 42) You may think you haven't got anything to say. But when you start writing about something, you realise you do have something to say about it. Part of it is finding the right way to say it, and getting it clear in your head, and clear on paper, or on screen, and then realising there are all sorts of caveats, it's like unravelling a golf ball, what seemed like a small boring compact object unravels into miles of elastic. Is that a good analogy? Or is it an onion , i don't know! What I'm trying to say is what seems small can in fact contain a lot of stuff. When you write a thought down you have to express it in words. And to express it in words you have to translate it from a thought, and that requires effort, you have to think about a thought or idea and translate it into a series of words. And it's then you realise that your thought was faulty, or missing some important facet. You realise how much ambiguity there is in language, and that writing it down brings out that ambiguity. To write something down clearly, you have to think about it clearly. 44) Are your beliefs really based on sound foundations? A saying I like is "we are all wise until we speak" I think that you could also re-phrased it as "we are all wise until we try and write it down". You thought you had it all sorted in your head but when you actually read it out, well you know, it doesn't make sense!! 45) Those that can write well think well. I heard this quote somewhere and it makes sense. If you can order your thoughts in a coherent and easy to read and understand way, that must be some indication of how well you thought that idea through. Everyone expresses themselves in different ways. Finding your voice and your own style will add to your authenticity and credibility. When you write about certain topics, you will find that they may arouse certain emotions unexpectedly or stronger than you imagined. This can be a surprise and quite revealing. Writing regularly can force you to do at least some self reflection. What are we if we are not our thoughts. Do you have control over who you are, do you marshal your thoughts or do your thoughts marshal you? 48) The more you write the easier it gets. What's your background? Not writing, programming? Like anything else the more you do it the better you will get at it. 49) You get the same benefits you do from keeping a diary or "journaling". Though those are private rather than public there could be a degree of overlap. Depending on the type of blog you are writing. You clarify your goals by revisiting them and reflecting on them. You will think about your next steps. Writing reminds us to think beyond the obvious. Writing can provide accountability to yourself. A written account can allow you to inspire others or yourself. Keeping a journal is a great way to build better habits, as it forces you to be aware of your actions and behaviours. For example if you're looking to watch what you eat. When you are forced to write every day, you write about what you do and it makes you realise what skills you have & you might think that is obvious: what you can do, but it's not. Because you do it every day or a lot so it's like second nature. You may have built up those skills over years - and the writing about them can give you an appreciation of them. The things we are best at we often think everyone can do - so you don't appreciate what you have to offer. Most websites are brochure sites. They are just versions of glossy paper brochures. A blog helps your clients/customers to get to know you. It can be a rich way to communicate with your audience. Because if it is very hard you are setting yourself up for a long drawn out failure. It is much better to set up short hard challenges and then extend them if you see fit. Fail fast if you can so you learn the lessons quickly. I managed to post 99 posts in 99 days and this last 100th post took a little longer. A lot of the posts were very short and not really proper articles, just a sentence or two, so in that regard I don't count myself as having truly completed the challenge. But it's good enough for me because I should have quit a long time ago. But, even though I don't recommend doing it, I'm glad I did it as I learned a lot. And I now also have a lot or resources I can build on. This was by far my longest post at over 3000 words, and the most enjoyable because it was the last in the challenge, and it was good to see how much I've learned. I have plans for a new blog that I will be starting soon and in which I hope to implement some of the lessons I have learned here. Please tell us about your blogging tips and experiences in the comments below. Well done Mike. You did it! This is a great honest post that all who aspire to be bloggers should read. I get the silver medal. Do you think there will be a bronze?